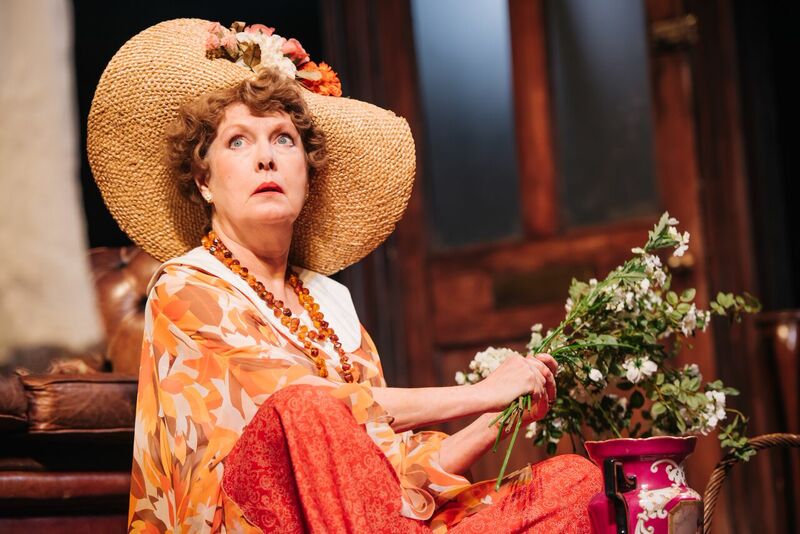 “Hay Fever” at the Royal Lyceum, Edinburgh: a sparkling, sassy, social comedy of (bad) manners. 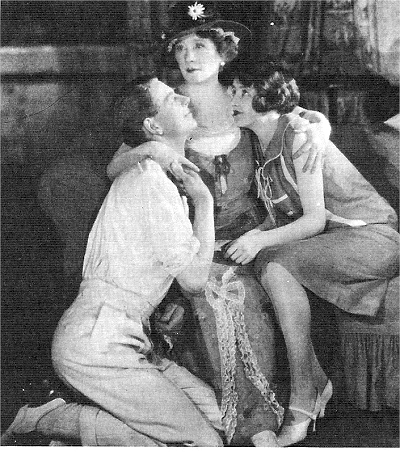 Hay Fever, 1925 premiere with Marie Tempest as Judith. 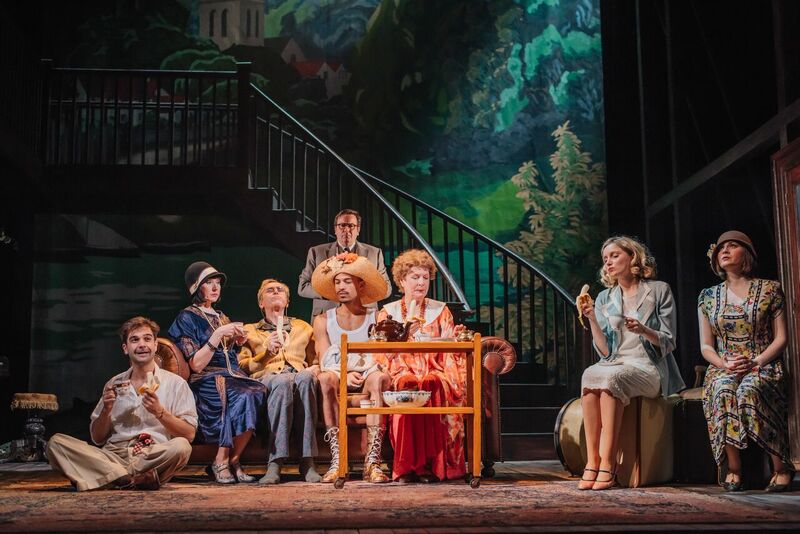 Set in the 1920s at a country house near Cookham, Berkshire, this is a comedy of (appallingly bad) manners in the company of the eccentrically Bohemian Bliss family – Judith, a recently retired stage actress, her husband David, a reclusive novelist, and their grown up, over- indulged children, Simon and Sorel. The pared-down timber design features the shabby chic lounge with piano, gramophone, drinks cabinet, staircase and garden backdrop. 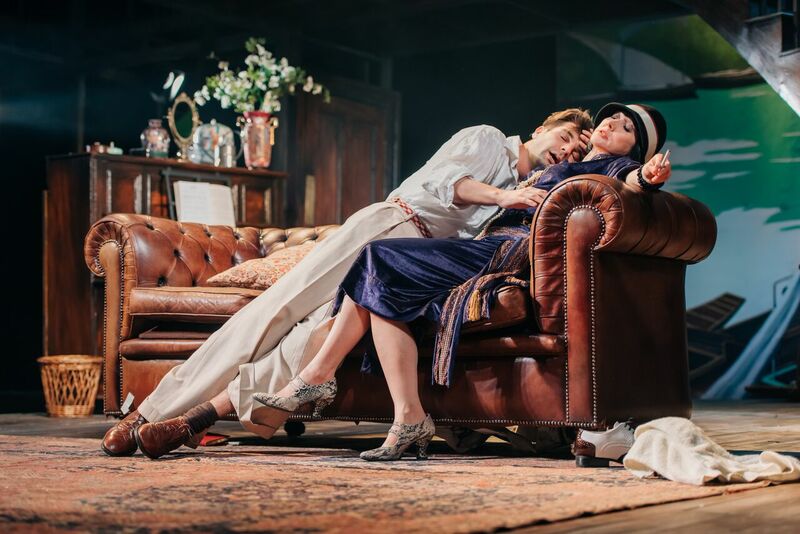 A battered Chesterfield sofa is the focal point for a series of intimately dramatised scenes, starting with the two siblings curled up amicably, sketch pad and poetry book in hand respectively. 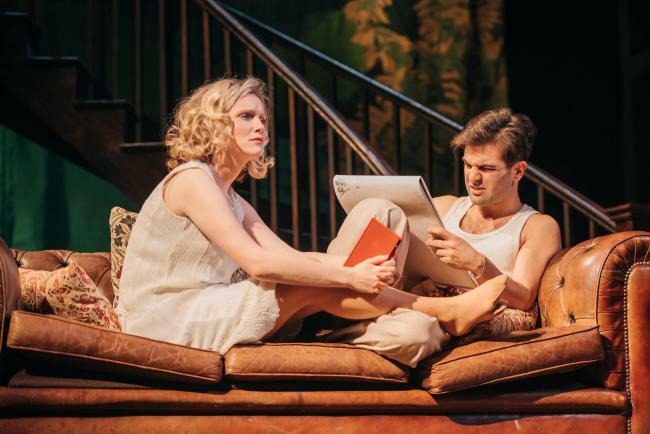 With her blonde curls in a virginal white dress, Sorel is a vain, pretty young thing, while Simon in his stained pyjamas, vest and old socks expresses a lazy, louche personality. It transpires that both have invited a friend, an older lover, for the weekend, much to their mutual annoyance. 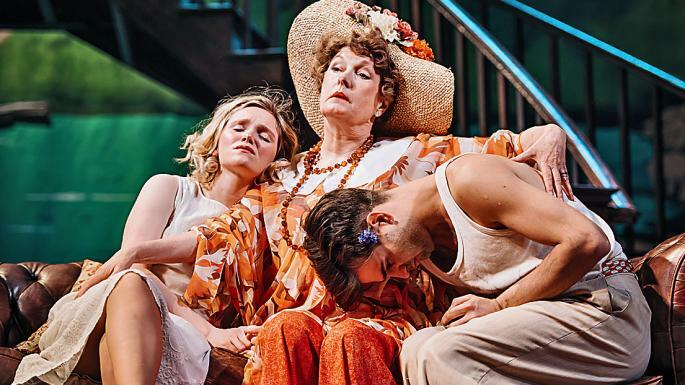 Gliding serenely in from the garden, Judith blooms like a herbaceous border in a flowery, orange kaftan, floaty palazzo trousers and straw hat, not forgetting green welly boots. Hearing that the scullery maid has toothache, she responds with egoistic vagueness, “Who is Amy?” before revealing that Sandy, her latest admirer, is coming to stay. To cap it all, David emerges from his hideaway study to announce that Jackie, his literary muse, will soon arrive at the station. The Japanese Guest room is beginning to look a tad crowded.! Each guest is “greeted” at the front door with a disdainful glare by Clara, the housekeeper (well played with grumpy dourness by Myra McFadyen), and carefree abandon by other family members. First of all is the elegant Sandy in brown and white spats, expecting a romantic tryst with the unattached Judith. “My husband – he’s not dead, he’s upstairs, ” she admits, leading him out to the garden. Then the glamorous, bob-haired Myra, struggles into the house complete with suitcase, hat box and tennis racquet. She is soon ravenously embraced by Simon, portrayed with languid pout and poise by Charlie Archer, his matinee good looks and camp manner, reminiscent of a youthful Rupert Everett. Richard Greatham, Sorel’s “suave, polished, debonair diplomatist “ arrives at the same time as Jackie who are left standing in the hallway, with no option to sit down and make small talk. This exquisitely stilted scene succinctly pinpoints the precise nuance of language, attitude, accent and astute observation of social class. To the diplomat’s volley of comments about the beauty of Spain and Italy, the sweet, young ingénue is like a rabbit in the headlights, quivering with nerves, her cheeks turning bright pink with embarrassment at her cultural ignorance of world travel. A trip to Dieppe, she realises to her shame, does not quite compare. Hywel Symons and Katie Barnett create a masterly comedic double act with subtle gesture and perfect timing. Hywel Simons as Richard, Katie Barnett as Jackie. An after-dinner parlour game of linguistic Charades, performed strictly to family rules, confuses the guests while the hosts relish the role playing, which spirals into exaggerated emotional outbursts with melodramatic flair. As Sorel tellingly admits, “We none of us every mean anything”. The sequence of outrageous antics, frivolity and fun around the house is choreographed by director, Dominic Hill like a fast and frantic eightsome reel as they each swing around between partners, an innocent bedroom farce acted out behind the closed door of the library and the shrubbery in the garden. Eccentric, unconventional behaviour perhaps, but Coward based the Blisses on the life and loves of close friends, visiting Hambleton Hall for weekends to be entertained by Mrs Astley Cooper, her equally dotty husband Clem and artist son Stephen. He would jot down snippets of dialogue, which inspired him to pepper the conversation in “Hay Fever” with such lines as “People have died from hiccups, you know.” and “This haddock’s disgusting!,‘ during an hilarious breakfast scene. 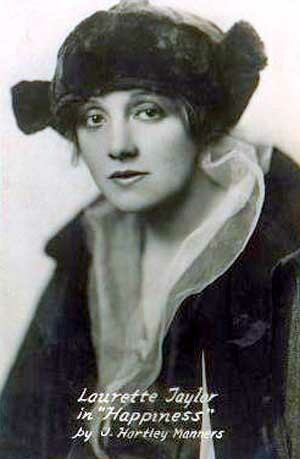 Judith is also very much modelled on the American actress, Laurette Taylor, who was sharply witty, intolerant and entirely devoid of tact; her family played parlour games on Sunday nights, disapproving of any self-conscious guest who didn’t play their part. Susan Wooldridge is meticulous in combining Judith’s winsomely warm personality with her cool, capricious nature hidden behind broad smiles and hearty laughter. Her tone of voice shifts from high pitched merriment to a deep throated growl to express feelings of delight and anger. 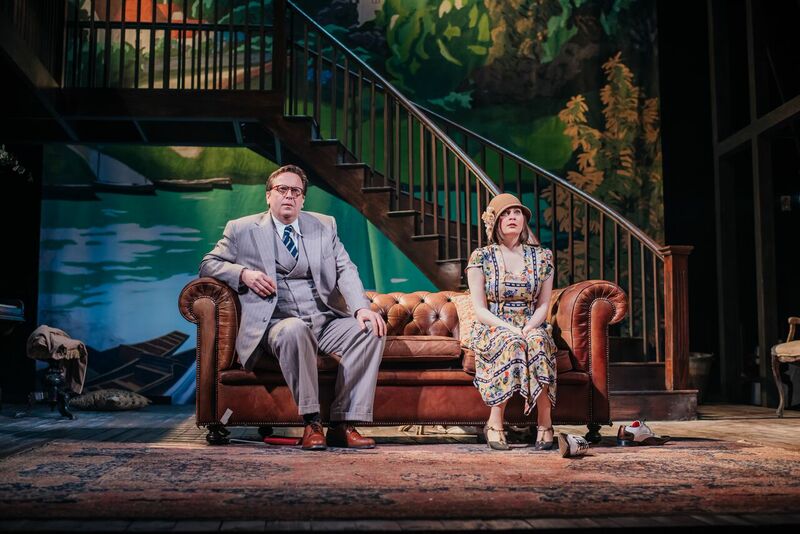 With a performance in similar vein to Sybil in Fawlty Towers, she likes to be a centre of attention and ignores her husband David, played by Benny Baxter-Young as a quietly idiosyncratic intellectual with nonchalant charm. Each member of the cast is spot on – a character parade of studied demeanor and facial expression – creating a slick, quick, energetic ensemble. A wardrobe of beautifully authentic costumes from summer frocks to glittering ballgowns and Tuxedos all adds to the vintage period with stylish aplomb. The bamboozled guests soon realise that their hosts are “artificial to the point of lunacy .. I believe they’re all mad!” and decide to take matters into their own hands and plan the great escape with hilarious results. 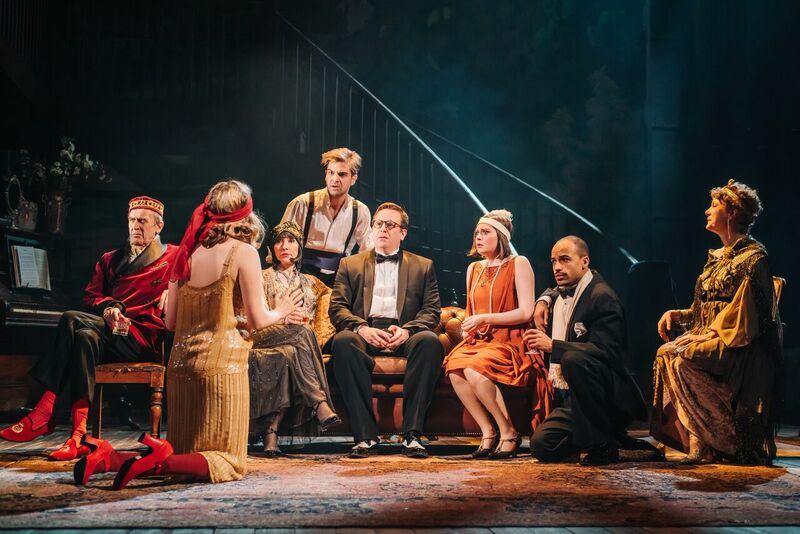 A sparkling, sassy and sophisticated revival illustrating once more Coward’s inimitable talent to amuse. The Citizens Theatre, Glasgow, 5 – 22 April, 2017. (Production photographs – Mihaela Bodlovic).